Stacie Tscherny dropped everything to take care of her son, Jerral Hancock, when he came home from Iraq without an arm. She helps take care of his two children now as well. Jerral Hancock wakes up every night in Lancaster, Calif., around 1 a.m., dreaming he is trapped in a burning tank. He opens his eyes, but he can’t move, he can’t get out of bed and he can’t get a drink of water. Hancock, 27, joined the Army in 2004 and went to Iraq, where he drove a tank. On Memorial Day 2007 — one month after the birth of his second child — Hancock drove over an IED. He lost his left arm and the use of both legs, and now suffers from post-traumatic stress disorder (PTSD). The Department of Veterans Affairs pays him $10,000 every month for his disability, his caretakers, health care, medications and equipment for his new life. No government agency has calculated fully the lifetime cost of health care for post-9/11 veterans of the wars in Iraq and Afghanistan with life-lasting wounds. But it is certain to be high, with higher survival rates, longer tours of duty and multiple injuries, plus the anticipated cost to the VA of reducing the wait times for medical appointments and reaching veterans in rural areas. “Medical costs peak decades later,” said Linda Bilmes, a Harvard University professor and coauthor of "The Three Trillion Dollar War: The True Cost of the Iraq Conflict." As veterans age, their injuries worsen, she said. Post-9/11 veterans in 2012 cost the VA $2.8 billion of its annual $50.9 billion health budget, records show. And that number is expected to increase by $510 million in 2013, according to the VA.
'Back Home: The Challenges Facing Post-9/11 Veterans Returning from the Wars in Iraq and Afghanistan,' was produced by News21, a national investigative reporting project involving top college journalism students across the country and headquartered at the Walter Cronkite School of Journalism and Mass Communication at Arizona State University. News21 is funded by the John S. and James L. Knight Foundation and the Carnegie Corporation. The Ethics and Excellence in Journalism Foundation, the Hearst Foundations, the Donald W. Reynolds Foundation, Women & Philanthropy at ASU and the Peter Kiewit Foundation funded the work of individual fellows. Like Hancock, many veterans returning from Iraq and Afghanistan have survived multiple combat injuries because of military medicine’s advanced care. 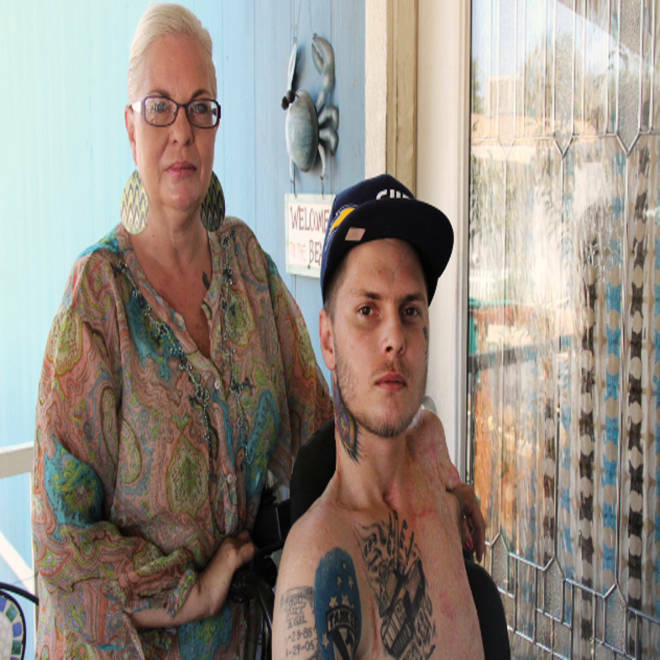 Doctors at Brooke Army Medical Center in San Antonio performed skin grafts and sent Hancock to spinal-cord doctors for the shrapnel that ultimately left him paralyzed. He still has his right arm, but he can only move the thumb on his right hand. Such injuries often lead to other medical issue -- heart disease and diabetes, for example -- as post-9/11 veterans age. Advanced medicine allowed many post-9/11 veterans to return home from war, but they will need care for the rest of their lives. Veterans with polytraumatic injuries will require decades of rehabilitation, according to a 2012 Military Medicine report that analyzed the medical costs of war through 2035. More than half of Iraq and Afghanistan veterans are between the ages of 18 and 32, and they are expected to live 50 more years, the Institute of Medicine reports. About 25 percent of post-9/11 veterans suffer from PTSD, and 7 percent have traumatic brain injury (TBI), according to the Congressional Budget Office. The average cost to treat them is about four to six times greater than those without these injuries, CBO reported. And polytrauma patients cost 10 times more than that. Post-9/11 veterans use the VA more than other veterans and their numbers are growing. Fifty-six percent of Iraq and Afghanistan veterans use the VA now. And their numbers are expected to increase 9.6 percent this year and 7.2 percent next year, the VA reported in March. In response to the increase in multiple injuries, the VA established its polytrauma care system in 2005, creating centers around the country where veterans are treated for injuries ranging from TBI and PTSD to amputations, hearing loss, visual impairments, spinal-cord injuries, fractures and burns. Post-9/11 veterans make up around 90 percent of polytrauma patients, said Susan Lucht, program manager of a center in Tucson, Ariz.
Each polytrauma patient costs the VA on average $136,000 annually, according to a CBO report, using VA data from 2004 through 2009. And many of their medical issues will never go away. Polytrauma centers have expanded across the country. But that doesn’t mean that all veterans live close enough to access them. Now an outpatient at the VA polytrauma center in San Antonio, Texas, Terence "Bo" Jones is learning to walk on prostheses and drive an adapted car with only his hands. For Army Spc. Terence “Bo” Jones, it is more important that he live near his family. 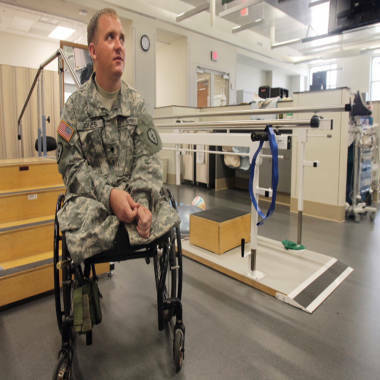 Jones was 21 when he lost both of his legs to an improvised explosive device blast in Afghanistan in 2012. It shot him 10 feet into the air and he landed in a nearby well. Now an outpatient at the VA polytrauma center in San Antonio, Jones is learning to walk on prosthetic legs. The VA also has supplied adaptive equipment for his car, and he is taking driver education to learn how to drive with only his hands. One day, he hopes to get a service dog, and the VA will pay for veterinary care and equipment for the dog to help its owner. When Jones finishes rehab, he plans to move home to Idaho, where he hopes adaptive equipment will help him return to a normal life. Jerral Hancock, on the other hand, knows that he never will. With the $100,000 the Pentagon gave Hancock for his injuries when he was discharged, he bought two mobile homes outside Los Angeles, one for him and his two children, ages 9 and 6, and one for his mother and stepfather, who take care of him full time. Hancock supports them all with his monthly disability check. On Memorial Day 2007, Jerral Hancock drove over an IED in Iraq. Just 21, he lost his arm and the use of both legs. Now, 27, Hancock suffers from post-traumatic stress disorder. The VA bought him a wheelchair and put a lift into his front porch. It widened the doors in his mobile home so his wheelchair could fit in and out. It will pay for his medications and all of his medical care for the rest of his life. The VA also bought Hancock an $85,000 arm that he could attach to his shoulder to use. But he can’t seem to get it to work. And it gave Hancock $11,000 that he put toward a seven-passenger bus with a lift. Even with all the money that the VA spends on Hancock’s care, he still lives in a mobile home, and his bedroom has little extra space with a hospital bed and a wheelchair in it. He can’t fit into his kids’ bedrooms. He can’t drink a glass of water on his own. And his air conditioning hardly works, even though he can’t be in the heat for too long because his burns prevent him from sweating. Hancock’s children also have had to adjust. This story was edited for length; read the full piece at 'Back Home': The enduring battles facing post-9/11 veterans.